Join the discussion on our forums! Come discuss Unexpected Results over in our dedicated Unexpected Results discussion topic. While I think he works a little better with Power of Creation , Khadgar definitely brings some cool potential to this card. Unexpected Results is not good! It's in all of these tempo mage decks, but it feels so bad to start with it in your hand. it's essentially a dead card til like turn 6 when you can use celestial emissary and even then - 6 mana for 2 random 4 mana minions isn't that helpful. After looking at stats- HSReplay stats back this up so far- Tempo mage decks with it included have a lower winrate than without it, and it is the lowest WR card in the whole deck. Making it even worse- WR DROPS when the card is actually played. Only 41% win rate when it's played. Crafted 2 on day one because it was in all the decklists. Feelsbadman. Save yourselves. Soooooo.... let's say you have 11 spell damage on board, will this just straight up do nothing? I'm not building a whole deck around making use of an effect as underwhelming as this. Meh... doesn't excite me. It's a decent card in a deck that naturally plays spell power but you wouldn't build around this card. As of now there's no spell power mage so my guess is this is pretty bad unless there's a ridiculous number of good spell power cards for a tempo mage then you jam this card in that deck. Does Spell Damage affects the number of minions summoned or summoned minion's Cost? On a more serious note, given that the Cost is given in an actual number (2) and the amount of minions is not (two), I would wager that the Cost is what is upgraded. So two 3-cost minions if you have +1 spell damage. Now potentially really good with the reveal of Celestial Emissary. Would be ideal in a tempo mage deck if said deck is the best that can be played in meta. It's ALWAYS been Spell Damage. EDIT: I see. I retract my statement. It was a long time ago but they aren't wrong. Probably because spell power in World of Warcraft also affects healing spells, and does not in Hearthstone. Yea, but spell dmg improves it. Aspirant provides technically unending spell damaga bonus. Vex Crow sees play in Tempo Mage, and its 3/3 body is worth about 2.5 mana. If you can get one or two spell damage buffs down, this is probably more valuable than the crow. 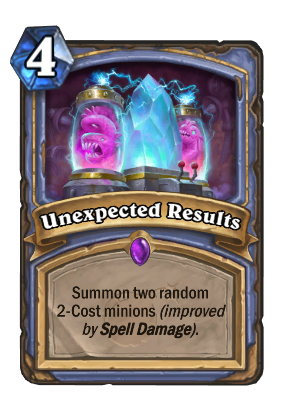 I could easily imagine Unexpected Results seeing play (maybe just as a one-of) in a Tempo Mage deck. I haven't seen Vex Crow played outside of arena in a long time. Is it still being used? HS Replay data suggests that it's still showing up in Tempo Mage decks, but to your point, I haven't seen very many Mages of any sort on ladder lately. I guess my point is more that Vex Crow was good enough to see play in a meta where Tempo Mage worked, so I think this could see similar levels of play.